1. Riders are mudders. Games in the mud are no fun, or at least they don't look like a lot of fun. Maybe the kids love it, who knows. But as mud games go, this one had pretty good execution. Both teams scored their share of points and executed fairly well. The rain stayed away for the most parts so the field didn't deteriorate any worse than it did all by itself. 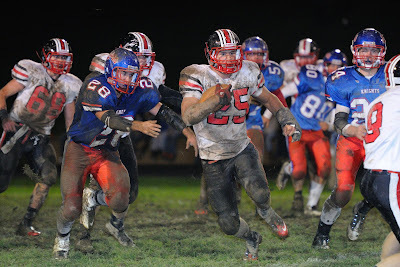 The talk all week was that West Holmes was letting the grass grow long and that would somehow play into their favor. I don't think it helped them as the Rider defense dominated the 2nd half and took away their only option on offense. 2. Mason & Stew. I'm hearing that the seniors of this team had a little meeting last week leading up to this game, and whatever was said had an impact as the leaders of this team stepped up and made plays. Mason Monheim was once again dominant running the ball and Stew Turner had some ridiculous grabs from his WR spot and set the Riders up with good field position on several punt returns. He had right around 170 all-purpose yards and an INT on defense. Mason tallied 150 rushing yards and 2 scores...all with broken left hand. 3. Davis Returns. Heard rumblings all week that senior captain may play, and he did. He limped off a few times, but his impact was felt both emotionally and on the field. Just a reminder to all...he is being closely watched by trainers and doctors. He STILL has a torn ACL that needs surgery, but the aid of a brace and the fact that he still has a small fiber of ACL intact, is allowing him to be out there. His hard work and dedication can't be questioned. He was not rushed back and he's not doing anything against doctor's orders. It was a game when we needed all hands on deck, and he contributed to a win like many others. 4. No 300. Thanks to the Daily Record for pointing out that West Holmes came into the game averaging over 300 yards per game in rushing. I think that was used as a motivator to this Rider defense. This unit has stuffed the run all year and last night was no different. The radio said West Holmes had 147 rushing yards on roughly 40 attempts, or less than 4 yards per carry. I've yet to see a team on our schedule that had success running the ball on us...and I don't know that the next 4 games will show that either. 4. Wacky OCC. It was the second straight wild week in the OCC with 2 more conference unbeatens going down (Clear Fork and West Holmes). Every team now has at least 1 loss in conference and Ashland, Clear Fork, Madison, Orrville and West Holmes are in a 5-way tie at 2-1. Wooster and Mansfield Sr. are 1-2 and Lexington is 0-3. It's still anyone's conference, but if Orrville wins out, they can do no worse than tie for the OCC title. Basically, the Riders control their own destiny. Win out and win the OCC and get a first round home playoff game. It's that simple. 5. Region 13. In doing some quick math, it appears that the Riders will be 6th when the new region numbers come out this week. Manchester and Brookfield lost but the rest of the top 8 won. Girard and Norwayne seem to be locked into a top 4 positions unless both have a slip up, and even then, I think they'd need 2 losses to fall out of the top 4. Black River and Canton Central Catholic have favorable schedules the rest of the way, so both should fall in the top 6 after week 10. Again, this is a situation that if the Riders simply take care of business on the field for the next month, then everything will fall into place. 7. Coach D & 50? Coach Davault stands at 46 career wins at Orrville. If the Riders can win out, the week 10 win over Wooster would be the 50th in his career. 50 wins in 6 years means his averaged over 8 wins per season. Throw in a win over Wooster potentially clinching the OCC and it could be one amazing night....but plenty of things to take care of between now and then. 8. Hoobler at IU. Indiana lost to Penn State yesterday 16-10, but Orrville grad Chase Hoobler had a good day on defense, making 4 tackles and forcing a fumble. He's averaging about 4 tackles per game on the season from his starting linebacker spot. 9. Big week coming up. Ashland game, Senior Night and the Hall of Fame induction on Saturday night. OHS will be a beehive. The 'RED RIDERS' at the top will be lit as the sun goes down, and will add a real nice glow to the north end of the stadium. Check back Wednesday for the Ashland preview.